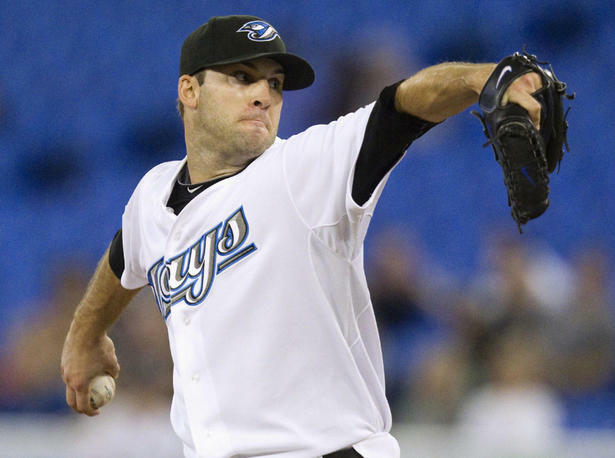 Expect big things from Blue Jays RHP Brandon Morrow this year after a quality spring (0.52 ERA in 17 1/3 innings pitched). LIVINGSTONE – Ah, Vogelsong. Definitely a guy you can’t avoid rooting for, especially being on one of the, if not the, best pitching staffs in baseball. It’s hard to remain relevant on a staff with the likes of Madison Bumgarner, Tim Lincecum and Matt Cain – but somehow Vogelsong did it last season. For me, my Vogelsong – and don’t judge me because I’m a die hard Jays fan – is Brandon Morrow. Yeah, yeah, you’re just picking the guy because he’s on your favourite team. In some respects, yes, but in many, he is the guy this year who will settle into his own and put together an all-star season. Since coming into the big leagues as a relief pitcher for the Mariners in 2007, Morrow has been on my radar. Sure, he was predominantly a reliever in his first two years (he started five games in 2008), Morrow showed potential to become a quality starter. In 2009 he threw 10 games as a starter and while his numbers weren’t off the charts (1.579 WHIP, 8.1 SO/9, 4.39 ERA), the Jays saw enough to bring him on as a starter and utilize the high-90s fastball, hard slider and twist-em-up change-up to bolster an under-performing rotation. Yes, the rotation has under-performed the last two years – but Morrow’s shown steady improvement, despite faltering late in games (usually somewhere after the fifth inning). Despite an 11-11 record with a 4.72 ERA, he fanned 203 in 179.1 innings worth of work and finished 7th in the league in strikeouts and his 10.2 SO/9 innings was the best in the American League and third in all of baseball. If his spring is any indication of what to expect from the hard-throwing right-hander, than a breakout season is in the cards. Morrow allowed just one run in 17 1/3 spring innings for a career-best 0.52 spring ERA. While he’s striking out guys less (7 Ks in his last 12.0 IP) he’s gained a lot of confidence with his change-up and curveball – both pitches that seemingly got him in a lot of trouble last season. Unable to rely on them confidently, hitters tagged him often on his heater and slider. While I think he’s looking at a big year – I would’ve been faced with a difficult task had he been available by the time I would’ve thought about drafting him. The last two years have been a tail of two different Morrow’s – the untouchable who would strike out the entire team and the guy who showed no confidence and got tagged for more extra base hits than one could keep track of. When Morrow is on, he is on and looks like one of the elites, but then he comes out and throws an egg of a game and one has to wonder if he is the real deal. With the potential for the team to put up quality run support on a more regular basis, Morrow could have the safety net of runs on the scoreboard allowing him to focus more on his pitching rather than overpowering the opposition (as we’ve seen with his lower strikeout rate this spring). And hell – if it’s not Brandon Morrow having the breakout season, it’s going to be a guy like Royals’ first baseman Billy Butler. Playing on a team with a group of young, potential superstars, Butler might finally have the bats around him to thrive. I expect a .300 AVG/30 HR/100 RBI season from this guy. Maybe even more. Regardless – Morrow is looking damn good and one can only hope he brings his quality spring right into the regular season.